Today, we’re on video#15 in our CCNAPHILIPPINES VIDEO SERIES. And this is one of the episode na ‘wag na ‘wag mong ma-mimissed. Because on this one, we are going to talk about the common networking devices and their functions. I shared the most basic and fundamentals of what they are and how they work including some tips that could help you in CCNA exam. This is of the the lengthy episode but I can assure it will be worth your time. I go all in on this and I bet you will learn so much if you finish the video. Again, if you have comment, suggestion or feedback please leave them below and I’ll read them one by one. I hope you enjoy this episode. Until the next one, cheers! What do you mean bagong topics? 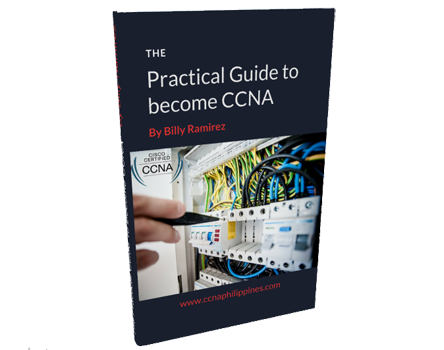 As far as I know the latest are the ccna v3.0 which included on the ebook. For complete details, visit here. Thank you! Galing ! Brother explanation mo. Nakaka inspire sa mga aspiring CCNA students. Hindi ko pa nabibili yong book mo kasi nagkasakit ako for a month . Once I get a job ulit sa BPO unang sweldo palang kunin ko na agad. Send me an email idol. Salamats!